Last week we talked about all the ways that you can become a homesteader in your apartment. I loved reading the comments and hearing from those of you who have already started implementing so many of these ideas in your own apartment home. Next stop in our journey of defining our fill-in-the-blank homesteads? 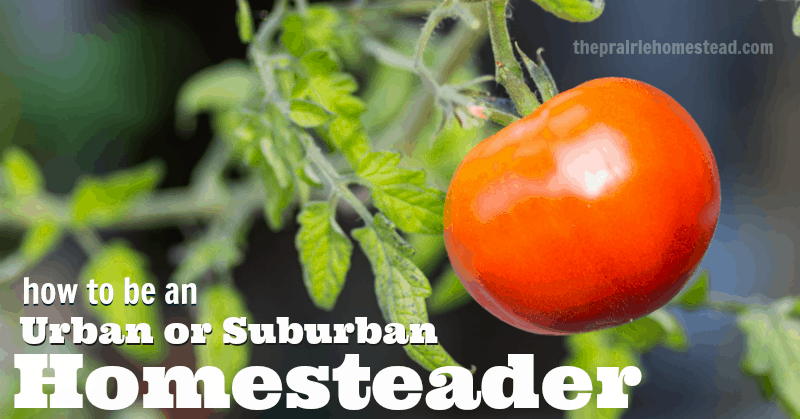 The urban or suburban homesteader. So what does the urban or suburban farmer look like? You may find yourself in the heart of the city (or suburbia) for any number of reasons, and you probably don’t see yourself pulling up and moving to the country any time soon. However, even though you may enjoy the benefits of city living, that homesteading spirit still burns deep inside of you. The good news? You CAN have your cake and eat it too! Of course, if you want to have your own suburban or urban farm, you can easily implement any of the ideas for the apartment homestead. But, having a little yard space gives you a few extra options, too. 1. Put in a Garden. Regardless of whether your yard space is big or small, it is almost always possible to find at least a little spot where you can plant some veggies. Choose heirloom varieties that aren’t available in your local stores (this year we grew Yukon Gold potatoes, since we usually only have access to Russets. It was a delicious change of pace!). Find out what varieties of vegetables thrive in shade and sun. With a little creativity, you should be able to maximize the harvest from any sized garden plot. And of course, like the apartment homesteader, you can always use containers and pots to grow a variety of edibles. 2. Compost. If you’ve read the story of my journey into homesteading and natural living, then you know that it all began with a compost pile! Turn your coffee grounds, egg shells, and kitchen scraps into valuable (and frugal) food for your urban farm garden. 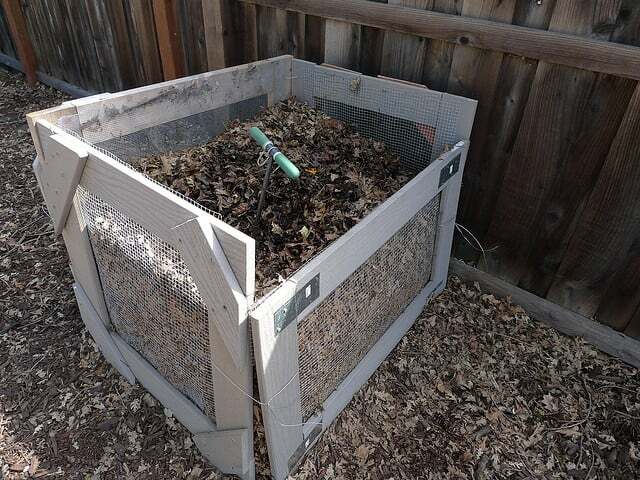 The sky is the limit when it comes to composting set-ups. Build your own bins, use re-purposed materials (trash cans, plastic storage totes, etc) or purchase ready-made composting buckets or tumblers. Use your rich compost to amend your garden plot, raised beds, or containers. 3. Become a Bee Keeper. While this may seem like a stretch for some folks, more and more people are becoming backyard beekeepers. My cousin Karla keeps a thriving hive in her very suburban backyard, which provides her family with delicious local, raw honey. And if you have children or grandchildren, just think of all the science experiments and hands-on learning that a backyard hive could provide. 4. Landscape with Edibles. Water is a precious commodity in the part of Wyoming where we live. Even though we have our own well and no water restrictions, I just can’t bring myself to pour water on a lawn (or even flowers…) that only live a few months and give us nothing to eat in return. It feels like such a waste. So, when I have an empty flower bed, I resist the urge to buy expensive annuals, and instead try to plant edibles in their place. This year, my “flower” beds around the house held sunflowers, tomatoes, basil, lettuce, and spinach. It’s still green, it’s still beautiful (to me anyway), and I feel better when I water it, knowing that it will help contribute to my family’s food needs. I’m not necessarily recommending that you rip out your entire yard overnight, but next time you head to the garden store, consider choosing fruit trees/bushes, herbs, or vegetables instead of annual flowers that will be dead in a short time. 5. Consider Chickens. More and more cities and towns across the U.S. are allowing their residents take part in urban agriculture by keeping backyard chickens. If it is allowed by your homeowner’s association, I highly recommend considering a small flock of your own. 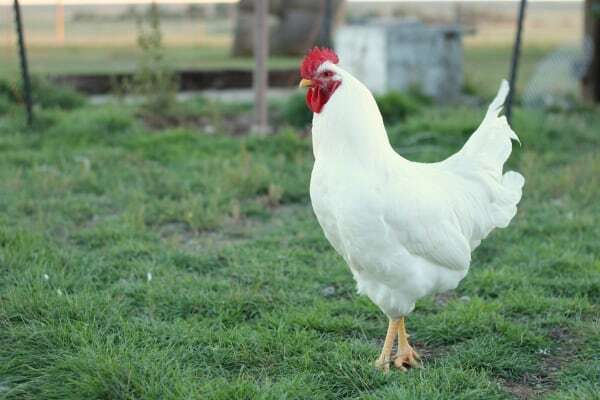 From eggs and meat, to extra fertilizer and sheer entertainment, there are many reasons to become a chicken farmer in your own backyard! 6. Transform your Kitchen into a Homesteader’s Kitchen. No matter what type of homesteading you do, food production and preservation is a HUGE part of it. Get busy learning how to make your own breads and cheeses. Learn how to can and preserve the fresh produce you find at your farmer’s market. If you have room in your basement or garage, consider purchasing an upright or chest freezer to hold frozen fruits/veggies, make-aheads like pie fillings, homemade broth, and beans, frozen eggs from your backyard chickens, and grassfed poultry, beef, pork, or wild game (buying in bulk is usually a more frugal option). 7. Keep Worms. 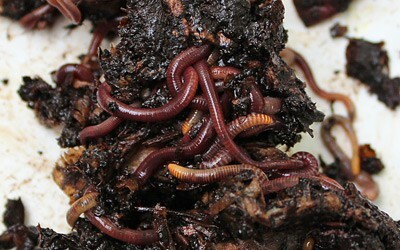 Compost worms are a wonderful way to put your kitchen scraps to good use, AND gain some new creepy crawly friends. Here’s a helpful post that highlights everything you need to know about feeding your new wormy buddies. A successful homesteader know how to make do with what they have and think outside of the box. Some of you may think I “have it made” on our homestead. Sixty-Seven acres, no covenants, no restrictions… perfect, right? Not really. There are plenty of things that I would like to change on our homestead. There are many things that are less-than-ideal. But, I work hard at being creative and thinking of ways to make the best out of what we have. 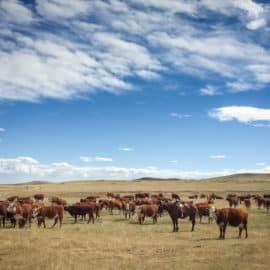 That is the mindset of the old-time homesteaders that made them legendary even today. So. I wanna know. How many of you are urban or suburban homesteaders/farmers? How have you found creative solutions to your obstacles? This is a great series. It reminds me of Jackie French. 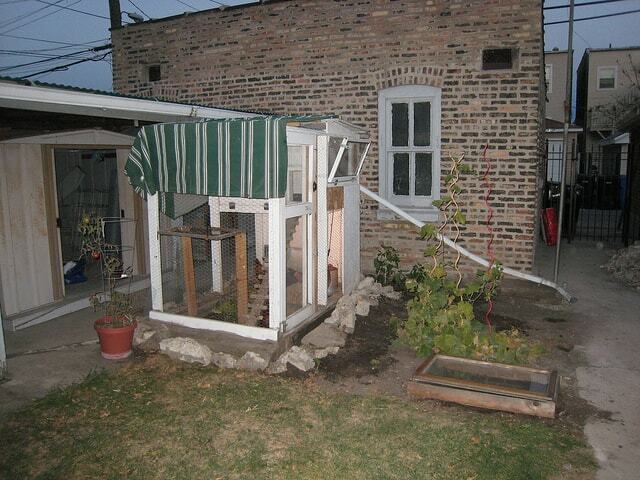 Her book, Backyard Self-Sufficiency, has many good ideas to get you going in a small space. We’re fortunate that (even on our 1/10th acre lot) we could find a location that met the city rules for a chicken coop. We just added chickens to our backyard homestead this past May. We’ve always had food growing. The house came with mature fig and loquat trees. We added limes, papaya, banana, almond, blueberry, strawberry, raspberry, apple, peach, plum, rhubarb and hops as perennials in addition to the veggie garden. We compost, vermicompost and mulch like crazy to help keep that all going strong. The big deal here in San Diego is the water. How can we hang onto as much rain as we can? Without a cistern, you can only catch so much in rain barrels. To maximize the rest, we really need to work on slowing runoff and increasing the ability of the soil to absorb and hold the water. Again -more mulching. One benefit of being in the city is that all the green recycling is converted to mulch and compost and is available for free pickup at the dump. Beth, you might want to incorporate “Hugelkulture” as a way to greatly minimize the need for additional water in your gardens. I loved this article. I often dream about living on a bigger plot of land, but you’ve reminded me that I already am doing so much right where I am. Like you I prefer to put my resources into growing as many edibles as possible in the garden. As well as putting vegetable plots in, I’ve also planted several few fruit trees around the place. I also compost and worm farm, and pick seaweed up from the beach to use as a fertiliser/mulch in the garden. The most time consuming part for us is ripping out everything that is already there. The ideal garden plot is currently full of irises and peonies, the landscaping is full of ancient evergreen bushes and river rock. The elderly folk who lived in our house previous to us let things grow up and out of control and I don’t even know where to start! This list was so helpful. It feels almost doable! I feel very blessed to live out in the country after being a city girl all my life! On our 25 acres, we have mature pecan trees and a peach tree (7 years old) and several muscadine grape vines. We have chickens for eggs and each year I plant as much as I can in the garden. This year we are making raised beds to deal with the yard taking over my garden each year! I have done some canning but should be doing more. You are so right about making do with what you have and making the most out of it.We can all lead much healthier lives no matter where we live. I am a temporary/half-hearted suburban homesteader. My move to full time rural homesteading is (I hope) 20 months out, so in the meantime I’m doing what I can here in the ‘burbs. I growing food in my front yard and planting perennial food plants for our use and the next people’s as well. I’m canning and freezing and setting up rain barrels, etc. Chickens are illegal here, so that will have to wait. Mostly I’m figuring out the whats, wheres, hows, and whys for the big move. Thanks for the information. There is just so much to think about! Oh my gosh I am so delighted to find your blog. We do a lot of the things you talk about here but I always love new ideas. I must check out your 16things for whey. I make cheese for years and always have plenty. Love your site! I live in San Francisco and last spring I tried to turn my backyard of nothing but weeds and sand into raised beds for veggies. But after months of work something came around at night and ate everything in sight! I was heartbroken. This spring I will try to grow lettuce and swiss chard in hanging baskets from the fire escape. Fingers crossed! I love this series. We live in a small city and have a little over 1/10th of an acre of land. This past spring we planted two 6×8 gardens along our deck and one 2×8 along the fence. I was able to plant lettuce, carrots, tomatoes, beans, peas, zucchini, summer squash, cucumbers, and peppers. This was our first real gardening experience and I learned a lot. Now I’m starting to plan for next year. In the coming months I hope to learn how to make bread and maybe cheese as well as how to use herbs. I’m hoping to put in an herb garden and more fruit trees/bushes next year. We currently have one blueberry bush. I used to think there was nothing we could do with such a small lot until I read The Backyard Homestead. I couldn’t believe the possibilities! I love your can-do attitude Rebecca- sounds like you have some wonderful upcoming plans! Just found your blog! Fantastic! So true! At this stage, busy with young kids and both working, creating a homestead on our urban block (almost 1000sqm) is enough for now, though we do sometimes fantasize about a ‘farm’change’! We can have the best of both worlds, though it can be tricky balancing ‘real life’ with our ‘hobbies’ of growing our own produce, keeping chickens, learning skills, wanting bees etc. It’s a great way to buy yourself a learning curve. We find using permaculture principles helps us find creative solutions to any issues! Thanks for this reminder! We just started our suburban homestead and somedays it feels overwhelming. Articles like this remind me to keep truckin’! Love the name of your homestead! Loving this series! I have a suburban homestead – half acre in the congested Bay Area. We have chickens, a mini orchard and a large garden. Before, I had a very small lot and edible landscaping in the front yard was the way to go. A grape vine over an arbor, chard mixed in with plants and so on. Next stop now – BEES! We are on just under two acres in a semi-rural part of the city, we purchased bare land and have been developing it for 10 years now. We’ve been adding trees (including our now producing orchard), gardens, and very hardy landscaping as the ground here is like cement and temperature range from some freezing in winter to 110 summers. This year we added the chickens and the girls are now really earning their keep. We’ve started an aquaponics system in a small greenhouse and once we get the knack of this we’ll expand further up on the property with larger tanks and Talapia, plus will be greatly increasing the gardens. We’ve been considered odd by our friends and aquaintances for a long time, but now find many want to know how to grow this or that to offset their grocery bills. I’m encouraged by these articles and to learn from others experiences. Will be checking in more as you continue this series. Thanks. Wow Lynda! I bet I could learn a thing or two from you! I’ve never even looked into tilapia or aquaponics systems, but it sounds intriguing. Keep up the great work! Just discovered your blog…love it…and love this post! Thank you so much for giving me some “food for thought”…literally! My husband, kiddos, and I live on a 1-acre subdivision plot in a semi-rural community. While we definitely have HOA rules…we appreciate the fact that our homes are on 1-acre lots and located in a small, 1-stoplight town outside of KC. While I have been bemoaning not owning multiple acres, you have helped me to see (especially from reading your comments) that I have plenty of room to be a suburban homesteader! We even have the house…we built a “Greek Revival Farmhouse” that is 9-years old, but looks about 90-years old. We love it…especially the wrap-around porch. 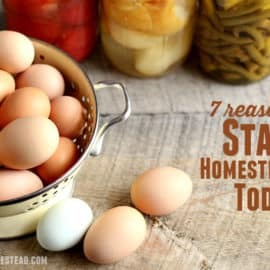 Thanks for all the great ideas and support to take on homesteading! This is great to show how you can make a homestead even in small areas. Thanks for linking up to Living Well Blog Hop. I tried a potted tomato plant once – but that was a bust. I have had lots of indoor herb gardens and they were very tasty. One things for sure, I decided last month that my cast iron skillet always needs to be either on the stove or within easy reach. It makes cooking such a pleasure! Hi Jill! I love all the great information you share. I just found the site last night, and yes… sat here and read every post. My husband and I are from CT, currently living in NC while he is in the Marine Corps. Anyways, we grew up having massive gardens, fruit trees, canning, and the occasional wild game. Living in NC and renting a house with a small fenced in yard has driven me crazy. I work at a greenhouse and have now switched to growing most everything in pots. I have had great luck and couldn’t be happier. Last night I ran and started growing sprouts again, and plan on making homemade ravioli tomorrow night. My husband and I talk non-stop about a homestead and sustainable living when we move back to CT in about a year. 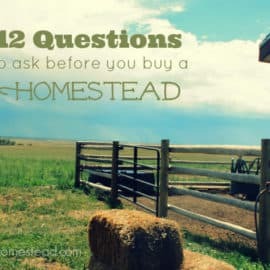 I am now considering our current house as a “temporary homestead.” Thank you for all your great info and ideas! Thanks for linking your great post to FAT TUESDAY. This was very interesting! I am very interested in haivng a bee hive. I love bees as they are great foragers!Hope to see you next week! You are featured at New Nostalgia’s Anti-Procrastination Tuesday! Thanks for linking up!! I love this post! We have put out a garden for the past 4 summers, every since we moved to our house. We try to add more veggies every year. We have herbs planted in with the front flower beds and an apple tree in there as well. When we moved here there wasn’t 1 tree in the entire yard. Our goal is to plant some fruit trees in the back yard in the spring. I do a ton of canning and freezing with the produce we grow. The hard part is trying to find a place to store it all in our small home (no basement or attic). We just purchased our first pastured hog and I requested the fat so I could render lard with it. 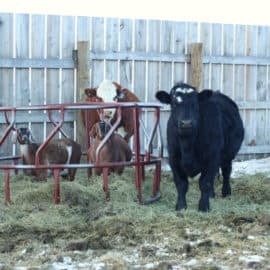 We also purchased 1/2 a cow that will be ready in about a month. We’ve learned a lot in the past 4 years, which will help us when we’re able to fulfill our dream of living in the country with a bit of land. Hi, I am really enjoying read this thread and the innovative stuff people are doing. I live in New Zealand on 13 acres about 20 kilometres out of Tuakau on the Waikato River. We grow most of our meat and milk our cow, Jessie the Jersey, each day; sharemilking with her calf. She keeps us in cheese, yoghurt- all our milk products. This year our second cow, Bluey will calve in April so Jess can then have a rest. We have hens and a big vege garden and small orchard. What we haven’t got we trade for with neighbours. I love cheese making with raw milk. The great thing about it is you always get cheese- it may not be quite the kind you were aiming for- but it’ll be cheese and it’ll be good! Judy- your place sounds lovely! What a perfect situation with your cows, chickens, gardens, and bartering neighbors! I am semi-retired now, otherwise I just wouldn’t have the time to do it all! Although I grew up a ‘townie’ I always had a dream to be self-sufficient in the country and luckily I found a very handy man to do it with who knows all about farming and how to keep animals and paddocks healthy and happy. We have a lot of work to do on our house but we seem to spend most of our time outside. We have a quarter acre in a rural town, but live within the city limits so we aren’t allowed raise poultry or goats, so we raise rabbits for meat. We have a couple decent vegetable and herb gardens, and our land came without a single tree, so this year we have planted a bay tree, a peach tree, and a plum tree. At the end of the season when trees are on clearance, we plan on adding some more fruit trees and maybe even pecan trees! My husband just started growing his own tobacco so he can roll his own cigars, and we are building a tea and medicinal herb garden this winter. Its been about 6 months since we decided to begin homesteading as much as we can. We’ve been transforming our almost an acre plot near Madison Wisconsin into a suburban homestead since 2000. It’s been terrific–just the other day I harvested seven different kinds of fruit from our property (raspberries, pie cherries, hardy blackberries, black currants, alpine strawberries, blueberries and cherry tomatoes) in one picking session! We’ve got apple trees, paw paws and a peach tree as well. We started keeping hens in 2001 and that’s been a lot of fun. Sadly, we have to move and we’re finding that home buyers are not impressed with all the work we’ve put into the property in terms of edible landscaping. My name links to a blog I’ve put together to showcase our property, and I’d love anybody’s advice on how to locate the folks who think raised bed vegetable gardens are a feature, not a bug! Wow Julia- sounds like you’ve done a ton of work! How utterly disappointing that prospective home buyers aren’t liking the edible landscaping… That would totally bum me out. 🙁 If they knew what was good for them, they’d be jumping at the chance to buy a finished homestead plot! If you like, maybe I can share the link to your website on my FB page? There’s a small chance that someone in WI might be looking to move. Let me know if you’d like me to do this. Hi Jill- sure, if you could share the link to my little website, that would be great! The right family/couple/individual is out there, just need to find them. . . Thanks so much. Billie-Jo! What an inspiration you are in making the best of what you have– you are an amazing woman– keep up the GREAT work. I am honored to have you as a reader! How does one keep rabbits, skunks, coyotes, and the neighbor’s cats out of gardens and edible landscaping? I’d love to compost too, but I’m told it can attract skunks, and we had a not-so-pleasant experience a couple summers ago that we don’t wish to repeat. who knew? 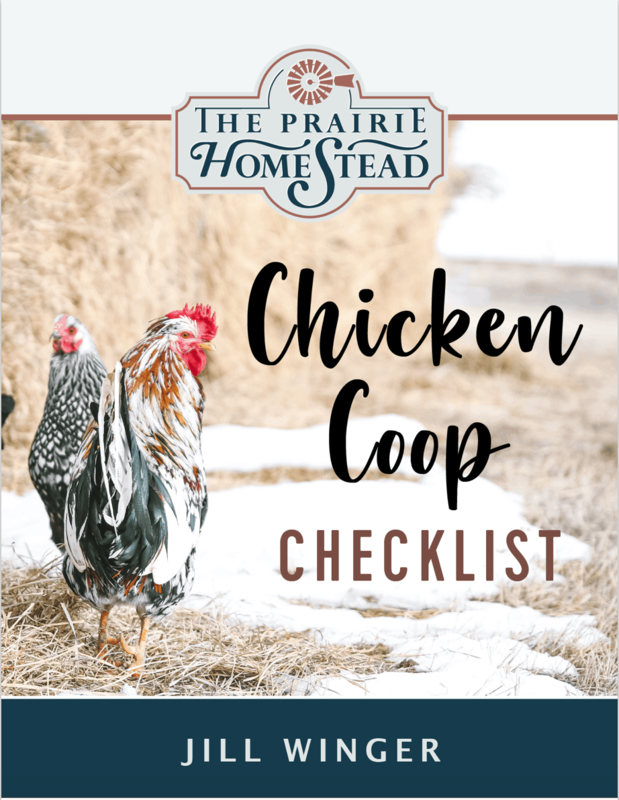 I am already a homesteader….yeehaw….just started the preserving track, next cheese….as I am renting, not allowed chickens or bees…..maybe the next place! I love reading all these comments-it’s so encouraging to see how many other people are suburban/urban homesteading! We bought 1/3 of an acre lot last fall and we have Nigerian dwarf goats, chickens and have added 8 raised beds and tons of fruit trees and berry bushes. I’m so impatient for the fruits to mature and start producing 🙂 I’d love to get bees too! I just recently accepted the fact that I wont be moving out into the country any time soon. But, Ive got a decent little homestead going on my 0.29 acres. We even just got chicks! Some space just makes you more efficient! I am a former homesteader. Health problems forced us to leave our farm and move to a small village house and equally small yard. We are heartbroken. 20 years living off grid. Trying to make the best of thibgs. Planted some fruit trees. Turning this into a wildlife habitat. We have bluebirds in the nesting boxes already. I make butter. Can produce. Nice to see others trying some things. I wonder about so many people keeping bees in tight quarters. Not sure about that. Chickens where there is enough room and not a nuisance with the smell.